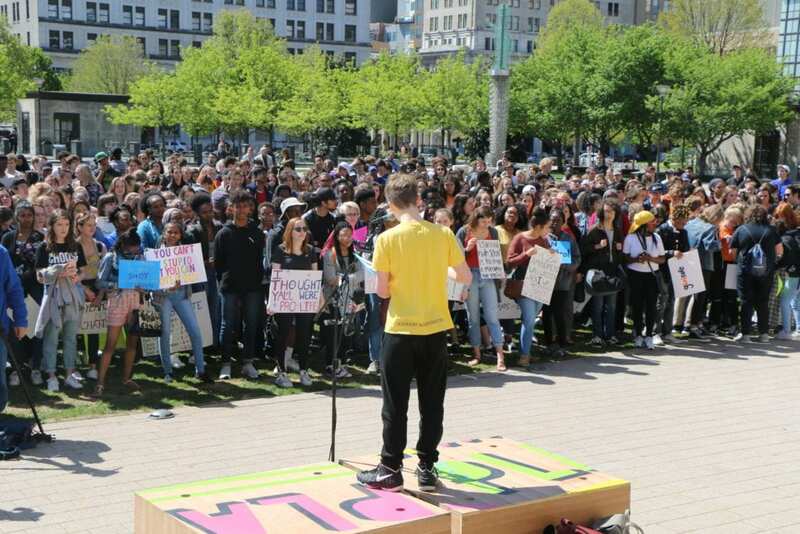 Nashville High School Students rally at City Hall Friday, April 20. The Columbine massacre happened nineteen years ago. The Margery Stoneman Douglas killings happened in February 2018. 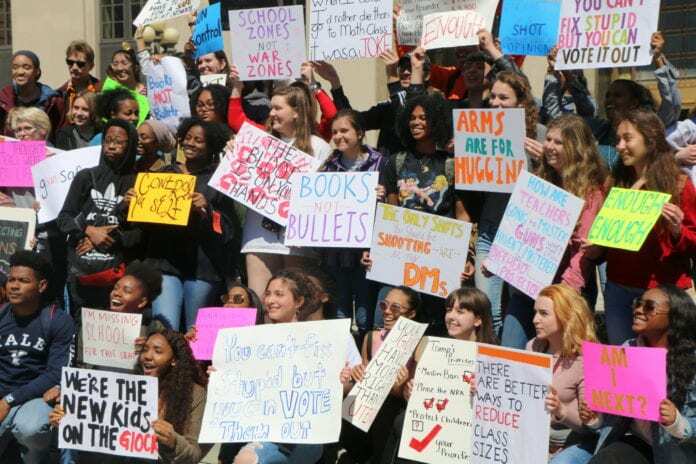 NASHVILLE, TN – Students from four Davidson County high schools ditched their books and picked up signs Friday morning to march against gun violence. Young people organized hundreds of walkouts around the country on the nineteenth anniversary of the Columbine High School shootings. Their message: Enough is enough. They want grown-ups to do something about it. “Sadly, since the responsibility has fallen on us we have to say ‘okay, this is something we have to do because if we don’t do it nobody is’,” said MLK Junior Jillian Garnet. Garnet’s parents didn’t give her permission to cut school. If they find out, she’s got a pretty good excuse. She was with the Mayor. David Briley encouraged the crowd of several hundred and told them to keep organizing until the people in power do the right thing. “I feel like we should have adults being actual adults and doing what they are supposed to do: protect us in our lives. If our lives matter so much why aren’t they out here doing something about it,” Garnet said. l-r, Kennedy Mathews, Chiamaka Diugu, Daje Boleyjack, Jillian Garnett are juniors at MLK Magnet. 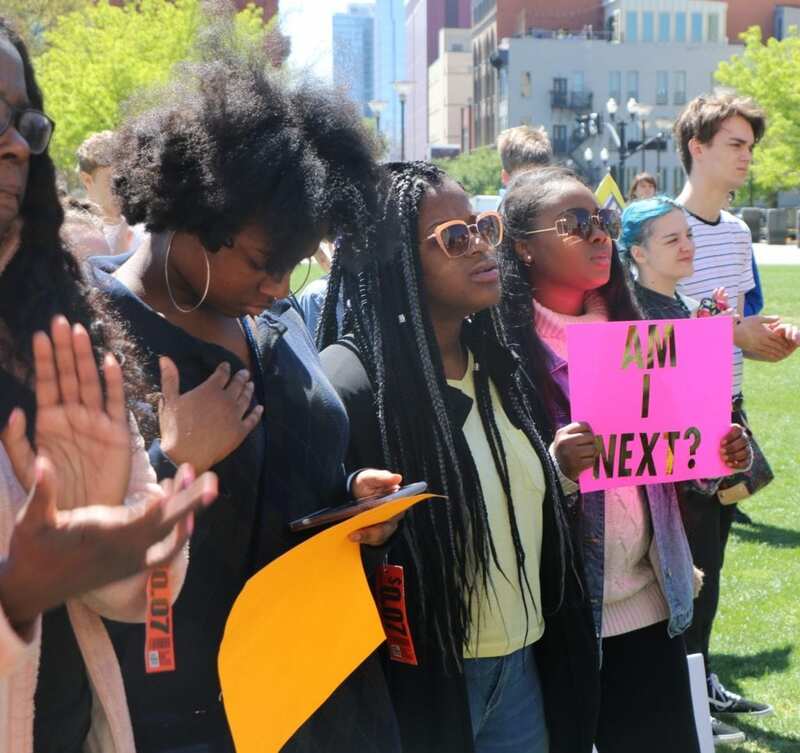 Several students from Hume-Fogg, MLK Magnet, University School, and Nashville School of the Arts (NSA) spoke about the history of school shootings, about the need for better background checks, school security, and about banning assault rifles. “Gun violence is ubiquitous. It’s students at the mercy of school shooters, it’s wives at the mercy of abusive husbands, It’s unarmed Steven Clark at at the mercy of cops. It’s not just schools. That what’s so sad,” said Jackson Powell from Hume-Fogg. “This cannot be a moment this has to be movement,” he added. The students held a town hall in the Cordell Hull building with legislators later in the day. Jackson Powell of Hume-Fogg Academic High School addresses a crowd at Public Square. “We’re the ones who are going to be more in charge 10, 20 years from now and I want my kids to be able to see that their parents actually made a difference in what they believed in,” said Kennedy Matthews of MLK Magnet. “I’m here to tell everybody that this is what I want to do. This is how I want to change things. It needs to get fixed and if it doesn’t get fixed, I’m going to keep coming out here until it does,” said Chiama Diugu, a Junior at MLK Magnet. “I should be in class taking my EOC in history but I am here because I care about this cause. 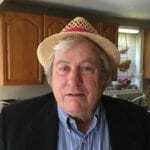 There are children who should be alive today but they are not because this cause has not been fought for before, “ said Sawyer Latham from NSA. Arjun Dasari of the University School noted that some African American and other minority students at Margery Stoneman Douglas High School said their voices have been ignored by the media and others in the aftermath of the of the Florida school shootings in February 2018. 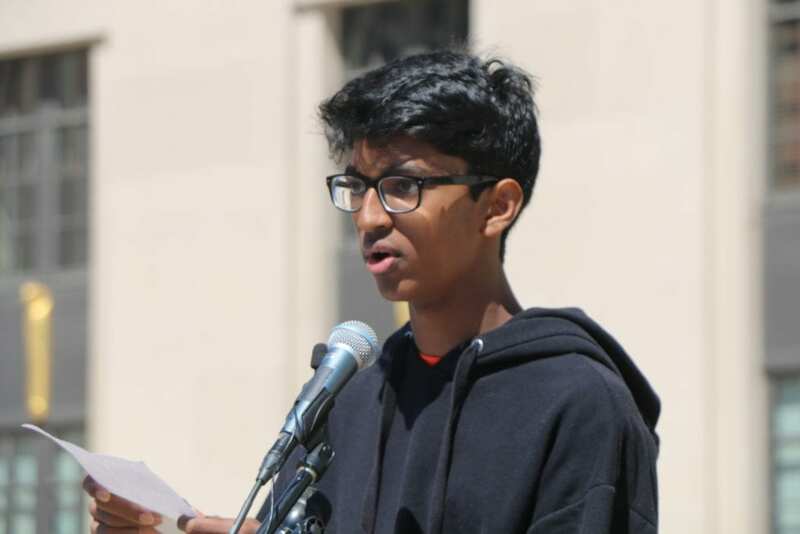 Dasari quoted a Stoneman Douglas student of Chinese descent who told a reporter that only when gun violence reaches into the high-income schools in white suburbia does gun violence become a national issue. “We don’t need another Great White Hope we need inter-sectionality and collective change. It is my aspiration that surrounding this movement for change black and brown youth can advocate and push for an equal opportunity to be heard,” said Dasari. Arjun Dasari from Nashville’s University School speaks about racism, sexism, and violence. “We stand here today because enough is enough. We should not wait for tomorrow because tomorrow never comes. Change needs to happen today,” said Latham.